FILE - People watch a TV screen showing U.S. President Donald Trump, right, meeting with North Korean leader Kim Jong Un in Singapore during a news program at the Seoul Railway Station in Seoul, South Korea, June 12, 2018. VOA Korean Service reporter Joeun Lee contributed to this report. 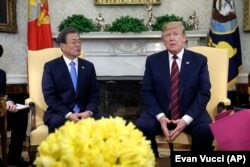 WHITE HOUSE — Sitting alongside South Korea's president at the White House, U.S. President Donald Trump expressed willingness to hold another summit with North Korea's leader to try to reach a sweeping denuclearization deal. President Donald Trump meets with South Korean President Moon Jae-in in the Oval Office of the White House, April 11, 2019, in Washington. 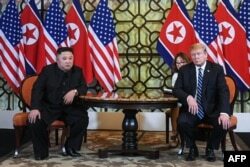 Trump has held two summits with Kim — the most recent one in February in Hanoi, ending early with no agreement as the North Koreans demanded sanctions relief and the U.S. delegation called for North Korea to give up its nuclear weapons.